"So, how are you planning to pay for that?" This should be the first question asked about any political program. Unfortunately, it's not. And that's why Sen. Bernie Sanders, I-Vt., and congressional candidate Alexandria Ocasio-Cortez, D-N.Y., are thought leaders for their parties. Take Sanders. He has been promoting his "Medicare for All" slogan for years. The left loves it. Among the top Democrats who have embraced this slogan are Sen. Cory Booker, D-N.J., Sen. Elizabeth Warren, D-Mass., Sen. Kamala Harris, D-Calif., and Sen. Jeff Merkley, D-Ore. Most of those senators want to run for president. So they understand that Sanders' bumper sticker policy is popular on its face. There's only one problem: Nobody asked that first question. This week, Charles Blahous of the Mercatus Center at George Mason University released a study taking a look at the cost of Sanders' preferred program. The total: $32.6 trillion over 10 years. Over that same period, our total federal spending is projected at $56 trillion -- and we're already racking up debt like there's no tomorrow on that budget. That means that we could double our taxes at every level and still not come close to covering Sanders' program. Sanders responded to this unfortunate news by attacking the study, blaming the nefarious Koch brothers for sponsoring Blahous' basic math. There's only one problem: The Urban Institute, a left-leaning outlet, estimated the cost at $32 trillion. So this isn't a right-left problem. It's a basic math problem. Sanders doesn't understand basic math. Or, more accurately, he doesn't care about it. And he's not alone. Ocasio-Cortez recently embarrassed herself on this same topic. 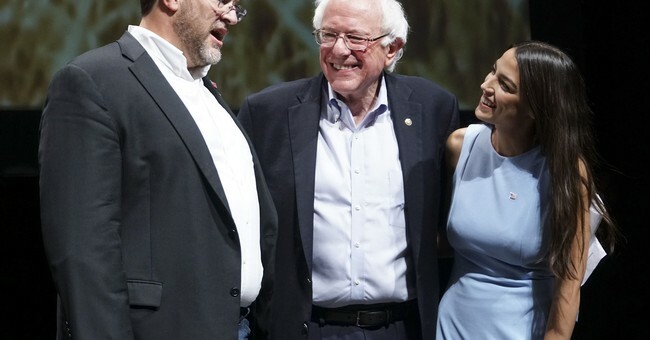 When asked about how she would pay for her program of free Medicare for All, college tuition and housing, she explained that we could just raise the corporate tax rate to 28 percent and close some loopholes, and "that's $2 trillion right there." Which would pay for ... approximately seven months of Medicare for All. Then, Ocasio-Cortez explained that she'd find money by cutting the defense budget ($700 billion per year), which would still not cover Medicare for All. And she'd create a carbon tax, which could crush industry, leading to lesser tax revenue. But Democrats aren't interested in who pays for things, because their ultimate solution is that nobody pays for things. Yes, really. According to Stephanie Kelton, professor of public policy and economics at Stony Brook University -- and a Sanders 2016 advisor -- we can simply pay for things by paying for things. She says the only limit on spending is inflation. Even Paul Krugman of The New York Times has called this idea foolhardy: Inflation is inevitable once people realize that the government is literally just printing money to spend it, and once people begin socking away cash in order to avoid the exorbitant taxes they're sure will come. The good news for Democrats is that nobody asks the key question. Even Republicans don't, which is why they spend trillions of dollars of their own. And so long as nobody is asking the question, Sanders and Ocasio-Cortez will be the future of the country ... until we run out of money.